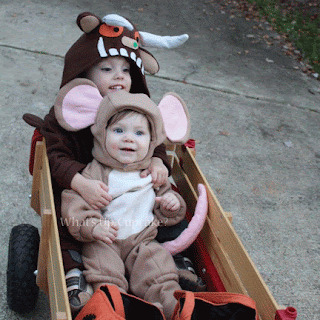 Back in good ol' 2015, I had a two year old and a 7 month old, and was wondering what I would dress them up as for Halloween. 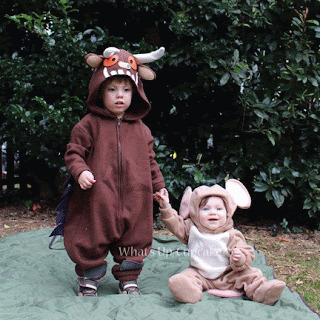 I wanted a costume due that would work with the two of them, so my heart was pretty set on making the Gruffalo and the Mouse. The problem being, it's a British book/show and I'm in the US. At the time, I believe the film was either pretty new or a little harder to acquire here. And my costume options were looking pretty limited. Those that I could find were going to have to be imported and were pricey, or were for an age and size greater than my two year old. I decided to start checking out Pinterest and similar sites for inspiration and even then, I found it lacking. So I decided to make my own version. For the Gruffalo, I took the Simplicity pattern 1351, version B (hedgehog) and modified it a little. I used the side spikes for inspiration of the purple 'prickly spikes down his back', and referred to the book for reference to his facial features. For the mouse, I had a slightly easier task as I could make some minor tweaks to Simplicity 2506, version D (mouse), and just change the coloring and the bowtie. Both costumes were fairly simple to assemble, with the greatest challenge being in piecing together the Gruffalo from the book. Thankfully, it's beautifully illustrated and the description given is so clear, that it made it easy to pull together. I started the costumes in August and had more than enough time, sleep-deprived and all, to pull them together. By the time Halloween came, the boys looked perfect and were cooperative in their costumes. 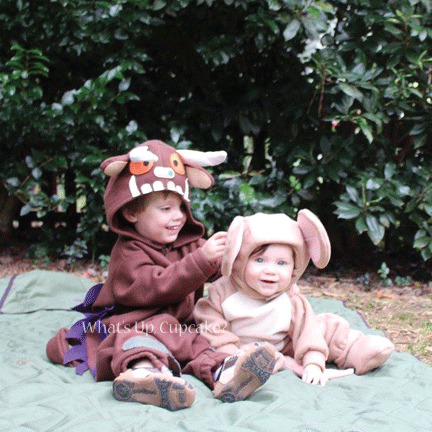 I used felt as the main material for both costumes which is perfect for how our Halloween's have been trending here in North Carolina. Not too cold, but it definitely starts to get chilly at night. 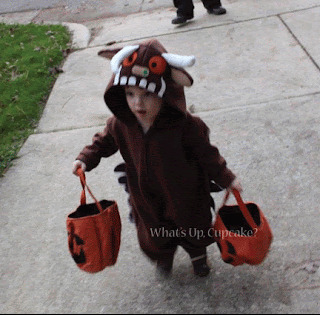 The Gruffly has definitely gained in popularity since then so is a bit more recognizable, but I'll admit that at the time, Big Fig was dubbed 'a cute monster' by most who saw him. But I was so pleased with the outcome. I'm excited for this year. I went shopping today for the materials for our Halloween 2017 costumes. Yes, 'our'. I'm going for a whole family theme. We did one last year and it was a lot of fun. They were all store-bought but the process was still pretty stressful, which encouraged me to try making them myself this time. 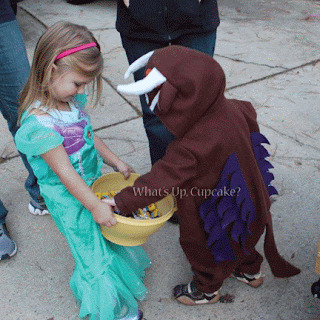 That and once again, I'm thinking my influence on costume selection is limited. This might be the last year I can sway Big Fig into his costume choice so I'm going big. So stay tuned. I promise to update soon with more details, this time as I actually piece it together. Just too sweet! Good to see you back posting. I've been remiss as well!